The Cyprus Mail have captured the mood of a very strange day, yesterday. This is the first time in 4 months that we have not see the blue sky above us. There was an eerie quiet around the island as cars appeared through the blur with headlights on during the day. The beaches were quieter too; and the sea, for the first time in months just ambled up to the shore, indolent, sleepy and with neither the moon or wind to whisk it into action. 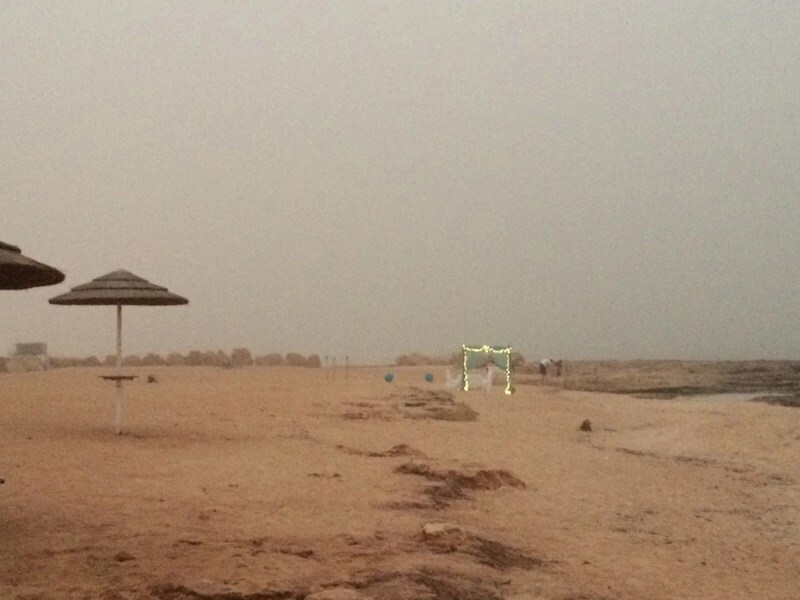 Families looked bemused on the beach; they did not expect to gain their ‘golden colour’ from a Syrian dust cloud. The house is covered in a thick layer of dust: the kitchen has turned brown; clothes have dirty beige smudges all over them and even Taz has a layer of sand on his coat. We have been told that it will clear this afternoon, but after that the massive clean up operation will start all over the island. The reserves of water, which are never abundant in Cyprus, will get severely tested as hosepipes attempt to wash it all away. Today, as we made our way into Paralimni all the windows of the cars we passed were closed. Motorcyclists, who usually charge down the road to the beach like they have drunk fifteen cans of Red Bull and have a death wish, are all wearing face masks: the world is truly a bizarre place. Update: The cloud is currently not expected to clear until Thursday, and then we have a heatwave to look forward to! At the moment, you can view the cam at Avgorou, west of Agia Napa. The Troodos Mountains look clear but those leaving the island from Larnaca for other countries were diverted this morning to Paphos. Flights now seem to be getting back to normal. As we headed down to Agia Thekla last night, it was great to see that even though the dust cloud had changed many peoples plans, it did not disrupt an institution that Cyprus can be very proud of: the wedding reception. 1) Use a Damp Cloth with a bowl first to remove the majority of the dust. Start at the top of your house and work your way down. 2) Then polish all surfaces and ornaments. Close your rooms when this is complete so that you don’t end up having to repeat the exercise. Alternatively – for those with a little more money – get a company in to do it for you! Now for the heatwave. Bring it on! Previous Article 21-Day Travel Itinerary Planner New Zealand – Both Islands!